Turkey Tolson Tjupurrula was born under a tree along a river bed approximately eight kilometers east of Haasts Bluff, Northern Territory. Turkey’s father was Toba Tjakamarra, an Emu man from the area around Lake MacDonald and Walungurru, present day Kintore. After Turkey’s birth, his family continued living in the bush, though they spent most of their time around the Lutheran mission of Haasts Bluff. When they began building the settlement at Papunya and work became available, the family finally came out of the bush and settled in Haasts Bluff. As a young man, Turkey worked as a stockman. His outfit was his trademark: a cowboy shirt, hat and boots. Turkey Tolson was one of the youngest original shareholders of the Papunya Tula Artists collective. He started painting in the early days of Geoffrey Bardon. 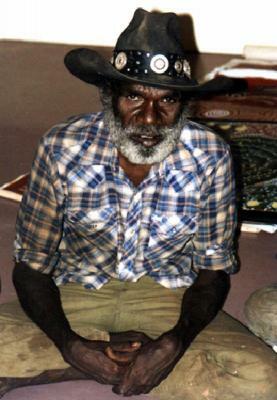 Turkey was chairman of Papunya Tula from 1985-1995. Turkey painted Bush Fire, Emu, Snake Woman and Mitukatjirri Dreamings, which originated from his traditional territory south-east of Kintore. Turkey was known as an innovative painter and experimented with various figurative styles, in addition to the strict, traditional Pintupi style of circles and connecting lines with which he became known during the first twenty years of his artistic career. 1992-1993: ‘New Tracks Old Land: An Exhibition of Contemporary Prints from Aboriginal Australia’, touring USA and Australia.? 1990: National Gallery of Modern Art, Rome, Italy? 1990: Gallery Gabrielle Pizzi, Melbourne.? 1988: ‘Papunya Tula Paintings’, Wagga Wagga City Art Gallery, Wagga Wagga, Australia? 1977: Nigerian Festival Exhibition, Lagos, Nigeria? Uluru - Kata Tjuta National Park. Victorian Centre for Performing Arts, Melbourne.